As we move closer to our move-in date, Niels and I have been thinking about new post ideas that relate to our earth-friendly, energy-efficient, universally-designed home. Our hope with this blog, in addition to reminding us how we came to the decisions and selections we did, is that our posts provide valuable information to others who are considering their own home building project. This week we received our utility bills, and we are quite pleased. One of several advantages of insulated concrete form (ICF) walls is that they have a high R-value, which means that the temperature stays more consistent than in a stick-built house. To provide some practical evidence, we will share our monthly utilities on the blog. As a bit of background, our previous house was a two-story colonial built with traditional stick construction in 2003. With the finished basement, it was 2,582 square feet. We had an energy audit last summer and the report showed that we had a very tight house, which means we didn't have a lot of heat loss because our windows were well sealed. In fact, we were told not to do anything else because then we'd need mechanical ventilation. We were already using all CFL bulbs, so the only changes we made were to add aerators to the faucets. So, in summary, we had an above-average energy efficient house according the the expert. Our new house has 2,885 square feet of (almost) finished living area (first and second floor). The unfinished basement is 1,700 square foot, for a total of 4,585 square feet. We have four heating and cooling zones, which gives us the ability to keep unused area cooler (or warmer, depending on the season). Of course, our house is still under construction, so we aren't using any appliances, and only a few of our lights are hooked up. Also, our house isn't completely sealed yet so we still have a few holes were cold air is getting in, the zones are not set up yet, and our front door and garage doors are open quite a bit as the crews are going in and out. That said, here's the first month's comparison. In January of 2010, our Dominion (gas) bill was $168.65 for 17. 6 MCF (old house). In January of 2011, our Dominion (gas) bill was $90.93 for 12. 1 MCF (new house). Since the vast majority of our gas bill is for heating and cooling, we were very happy with this initial look at savings due to the ICF construction. In January of 2010, our Ohio Edison (electric) bill was $135.27 (old house). 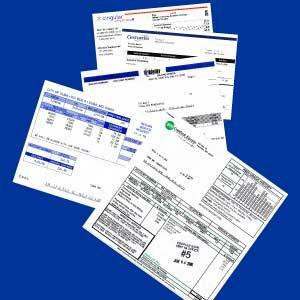 In January of 2011, our Ohio Edison (electric) bill was $20.81 for 135 kilowatts (new house). Unfortunately, since we moved, we can't get the kilowatt usage for last year. Obviously, we expect our bill to go up once we get lights, appliances, etc., but I highly doubt it will be anywhere near $135.